My granny lives on a farm on the west coast of Scotland near Oban, right by the sea where it’s windswept and wild. The best bit about going to visit is that you get treated to her home-made bread. She makes beautiful wholegrain rolls with seeds in and treacle to make them extra dark, rich and malty. They’re the tastiest, nourishing things you could imagine. 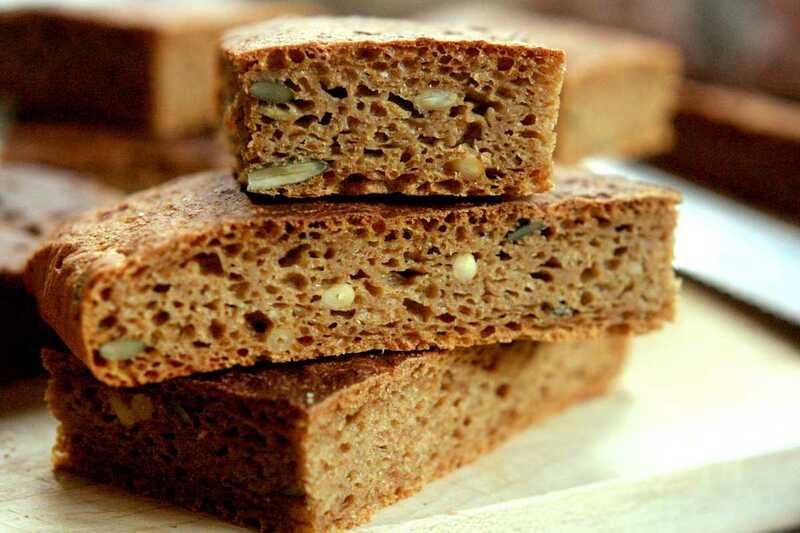 She used to make them with normal wheat flour, but in recent years she found that she has an intolerance to wheat gluten so she uses spelt flour now instead. Spelt is brilliant. It’s an ancestor of wheat that has been used for around 9000 years. It was an important crop in the development of civilisation because it thrived in poor growing conditions and was particularly resistant to disease and pests due the tough outer husk surrounding the grain. More recently it’s become redundant as preference has moved to higher-yielding varieties of wheat that are better suited to the commercial bread industry. You can still can buy spelt from some health food shops and delicatessens, which is good news because it’s absolutely delicious. As well as making bread with the flour you can make excellent risotto from whole spelt grains, as they do in a number of restaurants now. My granny doesn’t knead the dough at all, which gives a pleasing rustic consistency to the bread. She also uses fairly hot water to activate the yeast; the water shouldn’t be too hot, as this would kill the yeast, but just hand-hot (about 45C). This relatively high temperature causes the bread to rise quickly, resulting in lots of little air pockets. Her technique for baking the bread is to simply bake all of the dough into one large flat loaf, then cut it up into roll-sized portions once it has cooled. If you prefer, you could shape into individual rolls and bake them separately. Heat the oven to 200C. In a large bowl, mix together the flour, salt, yeast, pumpkin seeds, sunflower seeds and pine nuts. In a jug, mix the water with olive oil and treacle. Mix the contents of the jug into the bowl with the flour, cover and leave in a warm place to rise for 20 minutes. Line a large roasting tin with greaseproof paper and scrape the dough into it. Leave in a warm place to rise again for 10 minutes, then place in the oven for 20-30 minutes, until nice and brown on the top and sounding hollow when tapped underneath. Enjoy hot with butter.